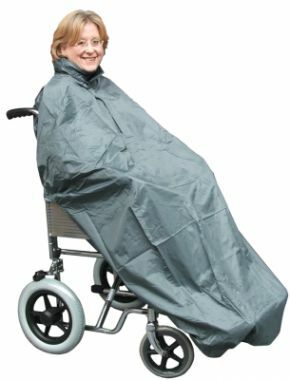 Wheelchair Clothing Koverall Without Sleeves. Wheelchair Clothing-Easy On - Easy Off Fitting. The Koverall provides head to toe protection, in a comfortable, reassuring way. Its elasticated hem ensures its close fitting, and hence reduces draughts. The neckline zip means it can be put on or taken off with ease, whilst its design ensures that it provides the highest level of protection. Its design enables your attendant to have full access to the handles and so remain in full control. A security pouch that doubles as a storage bag. There is a security pouch on the back of the garment that can be used for those bits and pieces; it also cleverly doubles as a storage bag for the Koverall, ensuring that it remains tidy until required. Size Medium Up to 5'4"